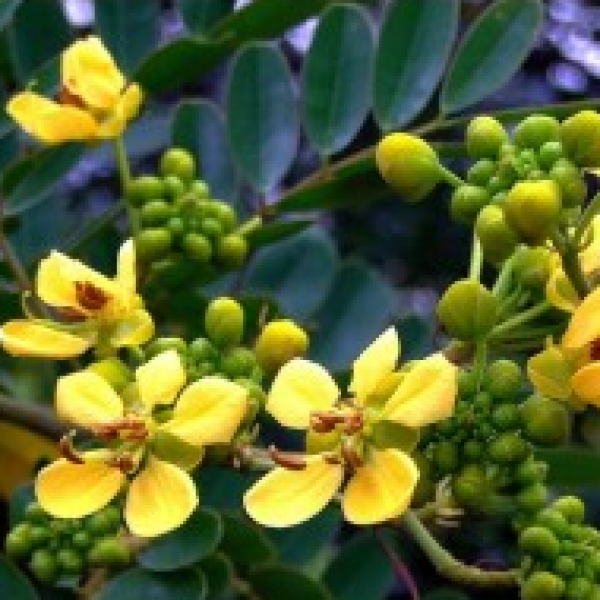 Senna siamea also known as Kassod Tree, Cassod Tree and as Cassia tree is a legume in the subfamily Caesalpinioideae. It is native to South and Southeast Asia, although its exact origin is unknown. It is a medium size, evergreen tree growing up to 18 m with beautiful yellow flowers. It is often used as shade tree in cocoa, coffee and tea plantations. In Thailand it is the provincial tree of Chaiyaphum Province and some places in the country are named after it. Leaves are alternate, pinnately compound, with slender, green-reddish, tinged axis and 6 to 12 pairs of leaflets on short stalks, rounded at both ends. This plant has medicinal value and it contains a compound named Barakol. The leaves, tender pods and seeds are edible, but they must be previously boiled and the water discarded. They are used in Burmese and also in Thai cuisine where one of the most well-known preparations is Kaeng khilek.